When ever I start writing one of these case studies I always seam to comment on my personal background with the Marque or particular model that is the subject of the article and this is no exception. I love Pinninfarina car design and Ferrari, ever since I was a kid and as an 11 year old there was a man who lived down my road called Geoff. Geoff had a 308 GTB in his driveway and I was desperate to go out in it. Then one day as I was walked passed his house the double garage door was open and he was working on two different Ferrari’s that I had not ever known about before. Two Bertone designed 208 gt4 cars just sitting there. I took the opportunity to introduce myself and speak to him. He was a lovely man and said that if my parents where ok with it I could go with him to Maranello Concessionaires next time he needed to get parts. So a week or so later he took me to Egham in Surrey and we had a tour of the facilities I was in heaven, I still remember the show room had an F40, a Mondial convertible and a 348TS on display. 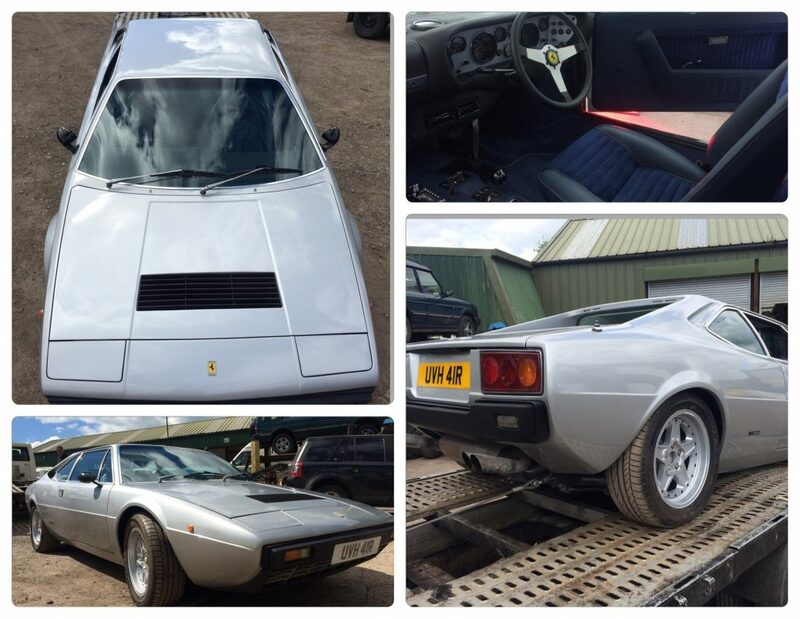 The workshop had a 512bb, 365 GTC/4 and other classics and the rear forecourt was littered in 348’s and 512tr’s waiting to be collected or sold. It is for this this reason the Gt4 Dino has always held a special place in my heart reminding me of that trip. This particular Gt4 arrived in quite a sorry state the paint was peeling (heavily) and the rust had really eaten in to the patches of bare bodywork especially on the roof but the owner had owned this car since the 80’s and new her well and I had been looking forward to getting upclose and personal with this Ferrari for months and she had finally arrived. The owner told us that he wanted to take her back to the original silver and that the last paint job was 19 years ago and that she had been bare metal resprayed previously. This sounded like a good starting point. I decided that we would hand strip the body as I had previously lost a lot of faith in the blasting processes (after trying a number of companies) and the option of chemically dipping the body was out of the question due to budget (full body and mechanical strip and refit costs). As we removed the paint the previous bare metal respray was rather aggressive and had left considerably deep scoring in all the metal panels, the boot lid was packed in filler where the metal had been stretched and the rear quarters where not much better, but that’s the good thing about stripping by hand you get to see what has been down and how it has been done previously. With the paint removed we could see all the problems and the parts we would need to make . Both rear arches required some small panel fabrication, along with the front window frame, door frames, head light covers, rear panel and of course the bootlid. The biggest problem was not so much the metal that need to be fabricated as the majority was fairly workable in terms of shape, it was the condition and the depth of rust that had set in to that temperamental Italian metal that was the biggest concern . The bootlid itself was a rather challenging skin to produce, as the rear edge rolled in to and arced over the Dinos rear panel. Whilst making the template I noticed that the original swage lines that create the recessed look was uneven running at slightly different angels and finishing at different distances away from the edge. I don’t know for sure if this was how it was produced in the factory or if it had been tampered with previously. Once the old frame work was repaired and our new skin fitted I could not wait to see her fitted on and i was very pleased with the result. With the metal repaired we set about treating the metal to liberal coating of rust inhibitor although we had removed the visible rust i just did not trust the metal and wanted to ensure that any small pours were cured. Belt and braces measures where taken next with an application of nice thick black non porous rust inhibiting epoxy primer. Now we just needed to make sure the panels where all nice and straight. The image below gives an indication of the paint and sanding processes involved in profiling the body. Black epoxy starts the process and helps is to visually identify shape issues, a high build primer is then applied and they are both sanded back with a long block revealing the hi and low areas in the panel. The body was then re primed and the whole sanding process repeated. Once the body appeared to not show any more undulations it was then given a final primer coat fine sanded in preparation for colour. With a test coating of silver base we could check how she was progressing and if she needed a bit more attention… she did. Another round of fine sanding and she was ready to try again. 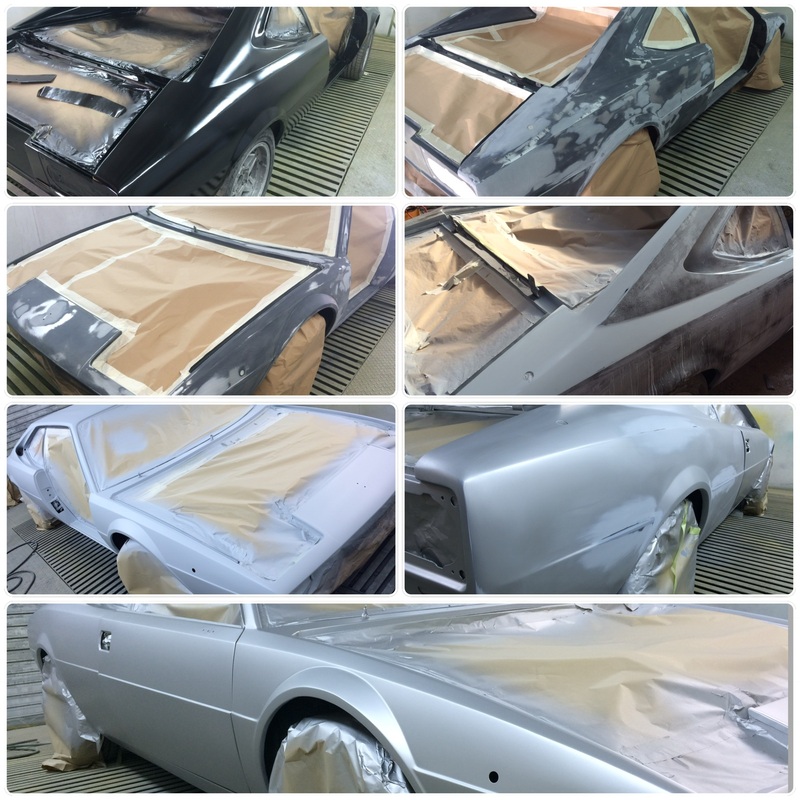 All the shuts and inner panels had been coated in silver that way we could paint the doors bonnet and body in one hit helping to maintain an even lay of colour across the external panels. The the silver laid the panels where all removed and the clear coat / lacquer application could begin. 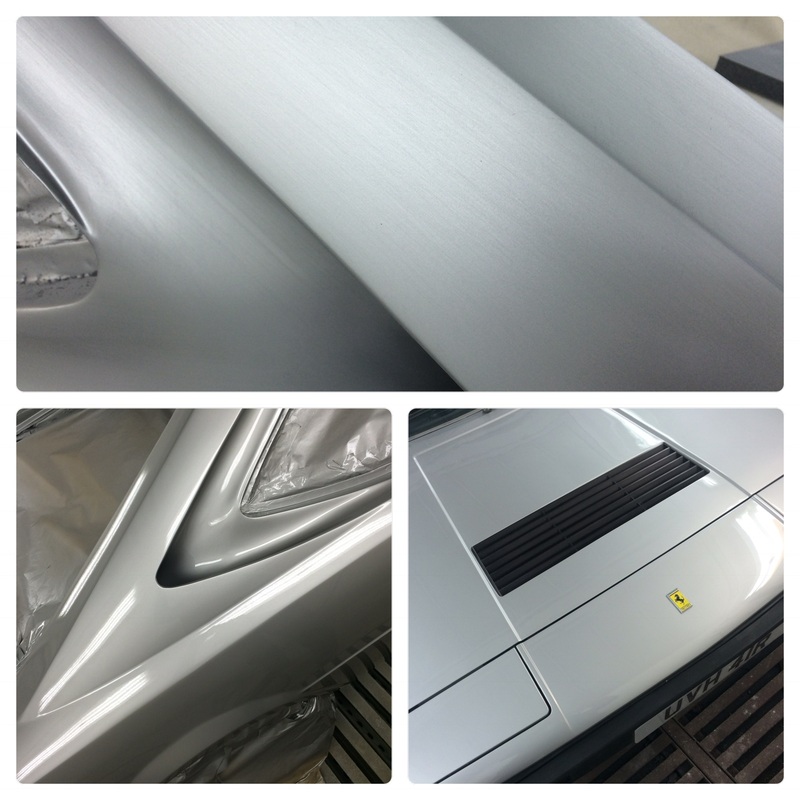 Top Shot: test base coat after sanding – I just like the way that the Dino looked like brushed steel at this point. Same area with gun finish Clear coat and finally a spinet of the refitted flat and polished body. This was a car I really looked forward to painting. She was very hard going and really put up a fight all the way through every stage of the process but that wedge design that Bertone was famous for looked great and is my eyes has really come of age. This entry was posted in Paint jobs by The Paint Shop Pros. Bookmark the permalink.